There are only 2 places i’ve struggled to get a reservation at more than The Spice Club; one was the best restaurant in the world at the time Noma and the other, Heston’s 3 Michelin starred The Fat Duck. 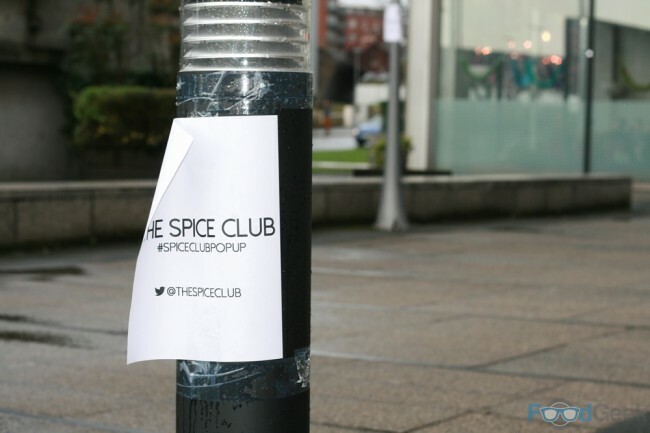 The Spice Club isn’t a fine-dining restaurant though and there’s no celebrity chef attached, it’s an ‘underground’ supper club run by Monica Sawney and her mother Anita with help from her brothers and Dad. 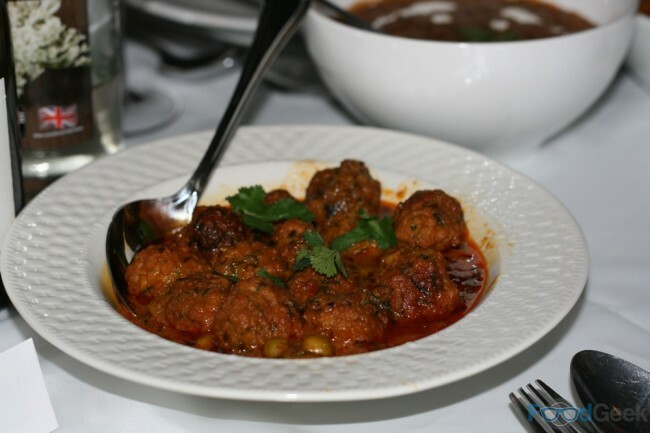 Serving family style North Indian cuisine from a ‘secret location’ only revealed to the lucky diners 24 hours before. 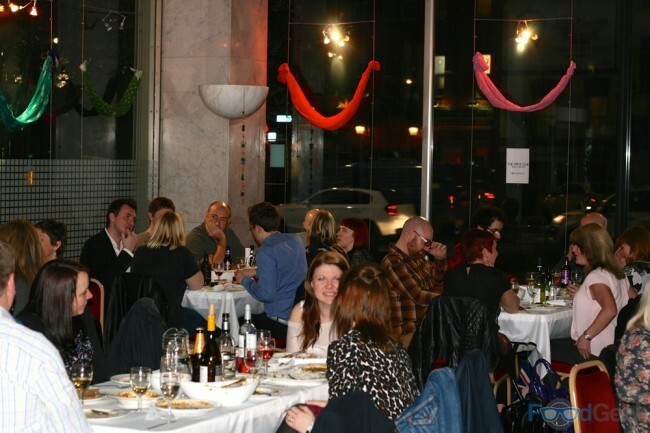 I’ve tried and failed to get a place at one of their supper clubs more times than I care to remember. 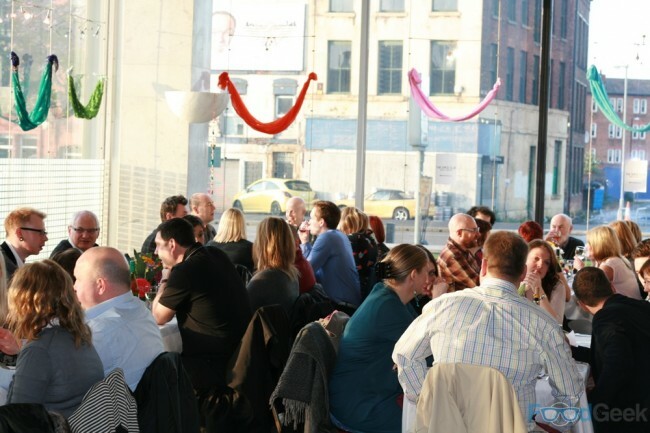 Their reputation and popularity has continued to grow since being featured on The Hairy Bikers TV show to such as extent that they were recently named in the ‘Five Best Supper Clubs’ nationwide by the Guardian. My luck changed last month when I finally bagged tickets to their next event, helped by the fact that this time instead of a small, intimate gathering they were running a popup restaurant. After purchasing I was simply told the date, that the location was near Victoria Station and further details would be given 48 hours before the event. The location was eventually revealed to be Noma! Not that one of course. 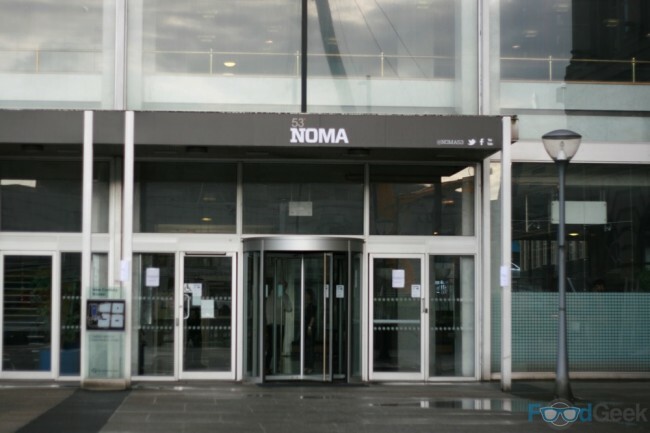 Manchester’s Noma is a 20 acre space owned by The Co-operative Group and available to hire for such events. After following the signs to the location which looked very much like a regular office on the outside, we were warmly greeted at the door by Monica and found a welcoming, makeshift restaurant on the inside. 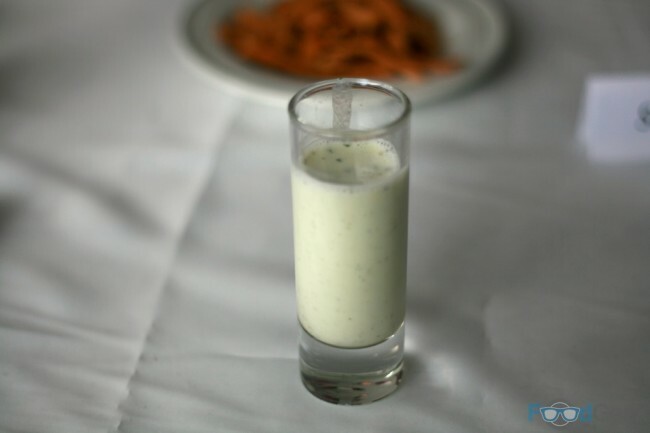 After a brief introduction from Monica the food began to arrive, starting with a shot of creamy, sweet Basil flavoured ‘Tulsi Lassi’ and crunchy, fenugreek flavoured ‘Mathi’. 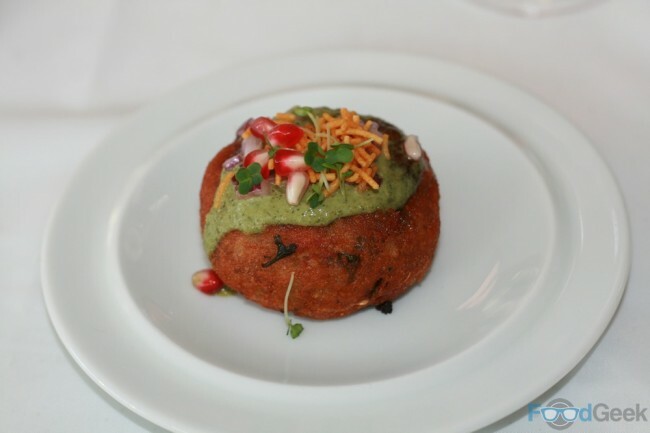 The starter ‘Aloo Tikki Chaat’ quickly followed, a beautifully spiced potato cake topped with coriander & mint yoghurt and tamarind chutney. A wonderful combination of flavours that danced in the mouth; from the warming spices to the cooling yoghurt with the sweet and tangy zing from the pomegranates it was a taste sensation. Main course was served family style with several dishes placed in the centre of the table for guests to fight over share. Including: Murgh Masala – chicken roasted in onions, ginger, garlic & tomato, Tori Kofta Mattar – spicy balls made from courgette and peas, Saag Paneer – Indian cheese cooked with spinach and Dal Makhni – a combination of Urad dal, kidney beans & lentils. 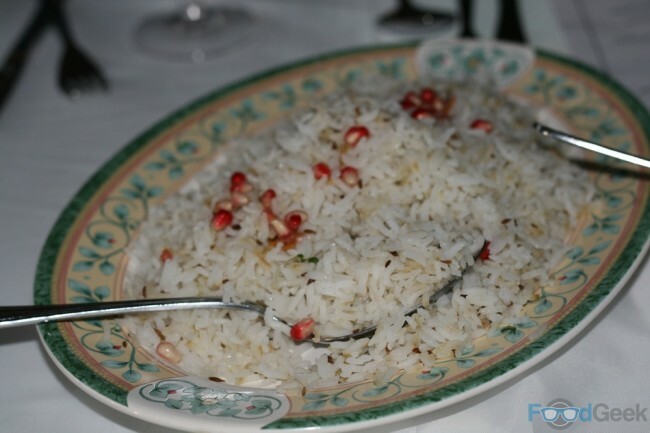 Along with a salad of cucumber, red onion & tomato, Basmati cumin rice and homemade chapattis. 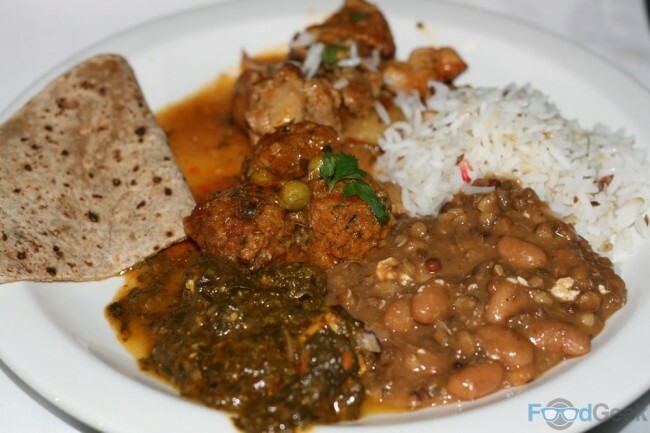 All four main dishes were delicious with superb spicing, personally i’d have liked a little more chilli heat but I realise I have a high tolerance and it’s impossible when catering for such a large group. 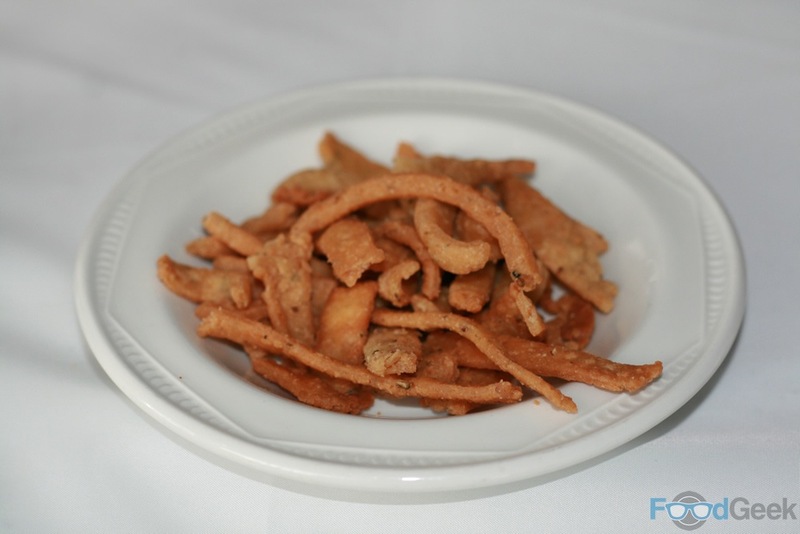 One of the few downsides of supper clubs over eating in restaurants is that the food has to please everybody and I don’t get to order the hottest dishes. It’s a minor complaint though as they were still incredibly flavoursome and I enjoyed every single mouthful. Including the second helping, and the third too! 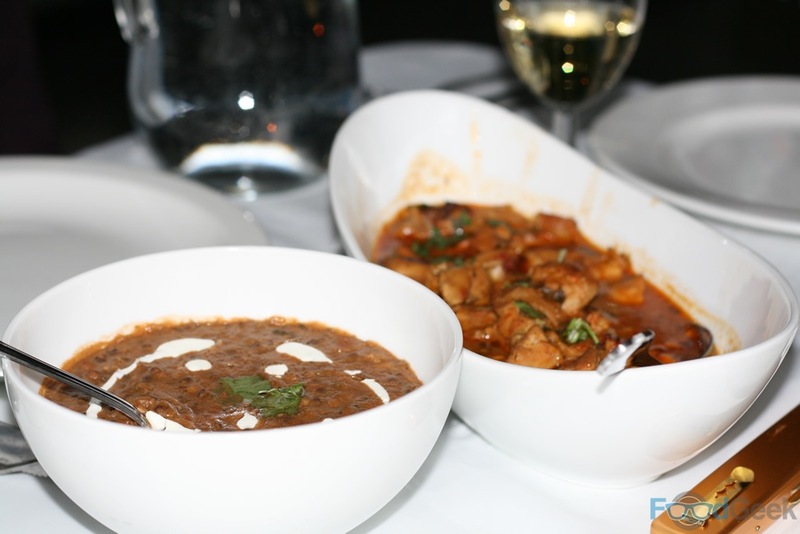 Neither of the four dishes would look out of place on the menu of any of the best Indian restaurants in Manchester. The freshly made buttery chapattis were also excellent. I don’t often get excited about Asian desserts, including Indian but the final course here was stunning. 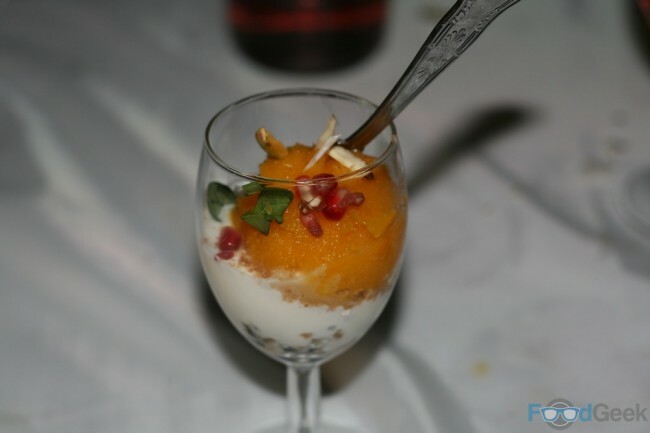 ‘Mango Malai’ was a glass full of sensational flavours; sweet saffron infused yoghurt layered with apple & cardamon crumble, topped with mango & pineapple sorbet, roasted almonds and pomegranate. The combination of flavours was unusual but stunning, from the tropical sorbet to the sweet, creamy yoghurt to the crunch of the crumble. I can’t remember ever eating a better Indian dessert. 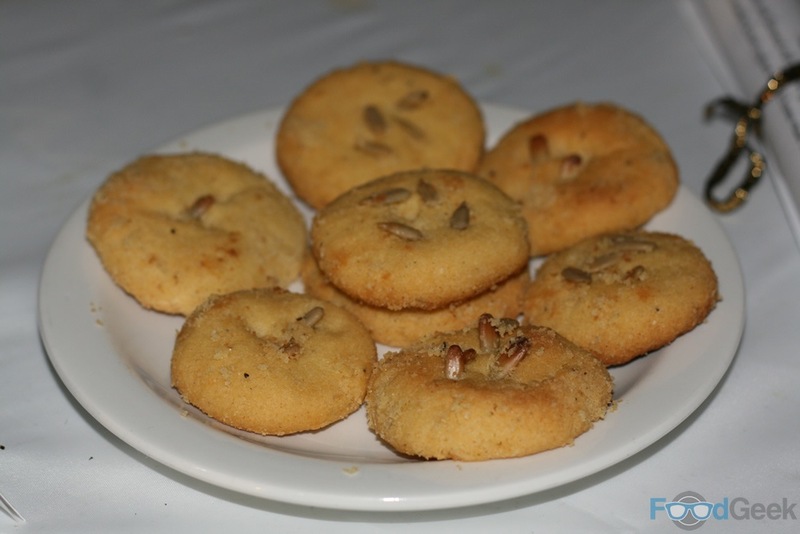 We finished with ‘Elaichi Chai’, a traditional Indian tea infused with crushed cardamom and fennel seeds and lovely sweet and crumbly ‘Cardamom Shortbread’. A fitting end to a truly great meal. Monica and her mother then took the time to go around every table asking for feedback and answering questions about the dishes which was a really nice touch. 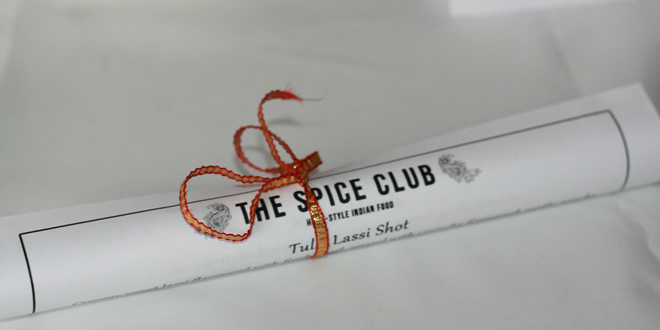 I loved my evening at The Spice Club Popup, it’s made me even more determined to get to one of their smaller events. Unfortunately (for me) judging by the room full of happy diners it’s almost certainly made it even harder than it was before. Previous: The Parkers Arms, Newton-in-Bowland – Definitely The Best Of British!